No matter what your aims are, this set of Songmics dumbbells will be a definitely choice to you. By providing different plates in different weights, the weight can be adjusted into 10kg, 15kg, 20kg, 25kg, 30 kg, you will find one that is suitable for you. 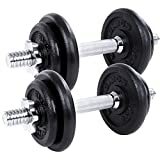 What is more, compared with the dumbbells padded with sand, this set has adopts solid iron bars. You can use this item to train yourself no matter where you are. Such a product will bring health into your life, why not try it ? – Please wipe off the anti-rust oil on the surface of the product before use (Please note that this product has been painted with anti-rust oil before transportation). – Please inspect buckle tightness before each use. If necessary, retighten the star-shaped buckles to ensure safety (Please note that the side with sealing disc should be close to the weight plates when tightening star-shaped buckles). – Please do not put the dumbbells in high places when it is not in use. – Children are not allowed to play with these dumbbells. – Watch out for your feet when placing the product on the floor.